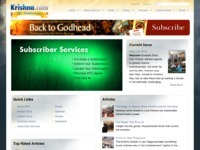 The website of Back to Godhead (BTG) where you can read the previous issues. It is regularly updated with the new issues. It also contains interesting articles which are published in the BTG magazine. Category Magazines and Journals May 7, 2012 by ISKCON Desire Tree.